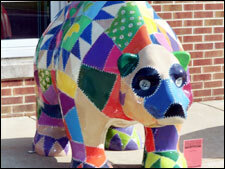 National Penn Bank’s Bally location, featuring one of three bears sponsored by National Penn Bank for the community Bear Fever project, was designed and painted by New Hanover Township artist Robert Williams. 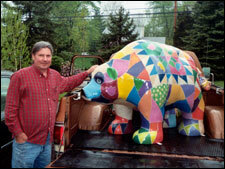 Bob researched various quilt patterns and themes at the Schwenkfelder Museum and created a quilted Pennsylvania German heritage design to paint onto the Bally Branch bear with acrylic paint. Two patterns—one, appropriately called “Bear Paws,” and the other, a “crazy,” less formal quilt pattern—inspired Bob’s design. Bright colors draw the public’s eye; the National Penn tulip symbol, incorporated into the pattern, recognizes the generosity of its sponsor. Catherine Bower, National Penn Communications Manager explained the tulip’s significance: “Its sturdy growth and dependability is synonymous with the bank’s approach to serving customers and communities.” The tulip has long held a special significance in Pennsylvania German design. National Penn Bank’s bears were placed at three different branches: watching over Boyertown at the Boyertown branch, is “Mary Beary” created by Candi Haas-Simmons; “Paws” guards the Bally branch, created by mural artist Bob Williams; and at the New Hanover branch, decorated by Mary Chisak, stands “Bella,” a bear with images from nature representing the eastern part of the United States on one side and images from the western landscape on the other.